Since we have landed in Eastern Europe, the area of greatest interest to me has been in thinking about how societies interact with tragic, and oftentimes violent, memory in spaces designated for creating and sharing memory. Places of memory, such as monuments, plaques, museums, guided tours, and other things of the like play an essential role in constructing a shared social memory for those who inhabit an area struck by violence, as well as for those who are merely visitors. I feel as though many sites or places of memory distort historical fact in an attempt to strong-arm a conscious stream of thought from society. We want places of memory to inform, remind, and help us reconcile so past mistakes are not repeated. Sometimes in the process of trying to honor those lost, we lose sight of the context that caused the cataclysm of the Holocaust. Attempts at reconciliation can be botched by language aimed at clearing the guilt of society rather than honoring the memory of those who were lost; insufficient memorials make their way into the public sphere and influence social memory in a less than constructive manner. In order for society to properly reconcile and learn from a tragic past, places of memory should acknowledge differing spatial practices and present memory in a way that provokes individual thoughtfulness rather than collective acceptance. Memory is the most complicated faculty by which we remember the past, it is subjective; it is unduly egocentric. The idiosyncratic nature of memory can generate conflicting viewpoints and subsequently isolate some individuals from others. In Geographies of Writing: Inhabiting Places and Encountering Difference, author Nedra Reynolds explains how spatial practices of the everyday force their way into discourse as well as how places and practices are constructed by structures of feeling and sedimented features of the habitual. In other words, how our individual memories influence interpretation and discourse in society. In the chapter “Learning to Dwell” Reynolds explores the concept of memory and its dynamic nature, as well as how the integrity of a memory is contingent on the place it is produced or shared within. Referencing geographer George Crouch, Reynolds writes, “…memories are a part of culture and depend, in various ways, upon the physical setting…Memories are of course contingent, unstable, and constantly reworked in further practices. They inform us today in a different way from the way they may inform a practice tomorrow” (Reynolds, p. 156). In this, Reynolds emphasizes how subjective memory can be, thus developing the nature of memory as an individual and transitory subject. The “practices” she mentions can be related to the spaces of memory meant to create and inform visitors of the past– the monuments, museums, and educational discourses which surround them. Reynolds frequently refers to the concept of dwelling as a metaphor for a third space, between public and private, as a set of practices and sense of place that affects how individuals interact with places and discourse (Reynolds, p. 141). In the subject of commemoration, visitors dwell in places of memory; absorbing and processing information in a way that is greatly influenced by their own perspectives, past experiences, and individuality. I find Reynolds’ work essential in understanding how society creates a space for sharing violent memories because the memories themselves are so emotive that they impact people in varying ways. She says, “It is important to understand geographies as embodied and how the process of the social construction of space occurs at the level of the body, not just at the level of the city or street or nation” (Reynolds, p. 143). Reynolds’ claim reveals how monuments and museums, these geographies, can be presented on one level but interpreted on another, seemingly individual, level. The space of memory presented by a city, nation, or organization may attempt to create a shared social memory– generalizing history to evoke emotion– all the while the visitor’s internalize this shared memory differently. Undoubtedly, each visitor has different memories and narratives within which the social memory fits, causing them to form differing personal narratives of a shared memory. In turn, each visitor “dwells” in the memory differently and the presentation of this memory can cause perspectives to clash. Out of the dozens of Holocaust memorial sites I have encountered while in Eastern Europe, many fail to consider the metaphor of dwelling in the creation of their spaces. Doing so can alienate some visitors and even place more emphasis on the guilt of the participants rather than honoring the victims, as well as cause an overemphasis on one view of history which excludes key contextual information. To understand this concept, the destruction of the city of Dresden can be used. While in Dresden, we learned the city suffered an intense air bombing in February 1945. The industrial city was left ravished– factories, train tracks, and buildings destroyed as well as thousands killed. Now, anyone who knows a small amount about WWII history will recognize that air bombardments of this nature were not unusual, and as an important industrial city to the Germans it is not surprising this particular city was attacked. Contrarily, the city of Dresden did not see this event as such and continues to tilt historical fact in their favor. We learned the city of Dresden had falsely publicized the damage cause during this bombardment by sharing an extremely emotive memory of the event. Dresden relates its own destruction to the destruction caused by the nuclear bombs in Hiroshima and Nagasaki. Obviously, this is quite an overstatement of damage and an over involvement of memory in history. Ater the bombing, Germany reported causality numbers in the hundreds of thousands when in reality that number was around 25,000 people. In a way, Germany used this particular bombing as a form of propaganda to emphasize the “cruelty” of the Allied forces; meanwhile they failed to share the similar destruction they caused during the Blitz attacks in England. The perpetuation of these false numbers continued well into the 1950s and 60s, and some people today still feel as though the final count of 25,000 is far less than it actually is. This distortion of individual memory can be attributed to the social memory first created by the Nazis and continued by the Soviets. For decades after the fall of Nazi Germany, the social memory the Germans had created about the bombing of Dresden has perpetuated into contemporary politics. The Germans had marked this memory as an uncessary act of violence and aggression by allied forces of the same scale as nuclear destruction– a memory that many still believe today. While in the Dresden, we visited an exhibition, which shared the memory of the nuclear bombings as a not-so-subtle comparison to their own WWII era destruction. 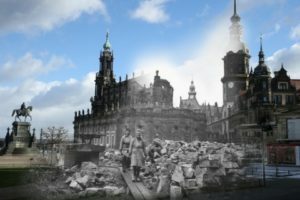 The city of Dresden has clearly been dwelling in the violent destruction of their history and as a result has created a highly emotive history that is more of a stretch of memory rather than of fact. Dwelling in the memory determines not only where share this memory, but how it is shared and how we can work with the memory (Reynolds, p. 157). Reynolds explains how this process of learning plays an essential role in shaping history because spaces like this not only determine the history shared within a community, but also the work we do with these spaces and the discourses that surround them. By creating this exhibit in the heart of Dresden the city conspicuously draws a strong connection between the devastation of Hiroshima/Nagasaki and Dresden. 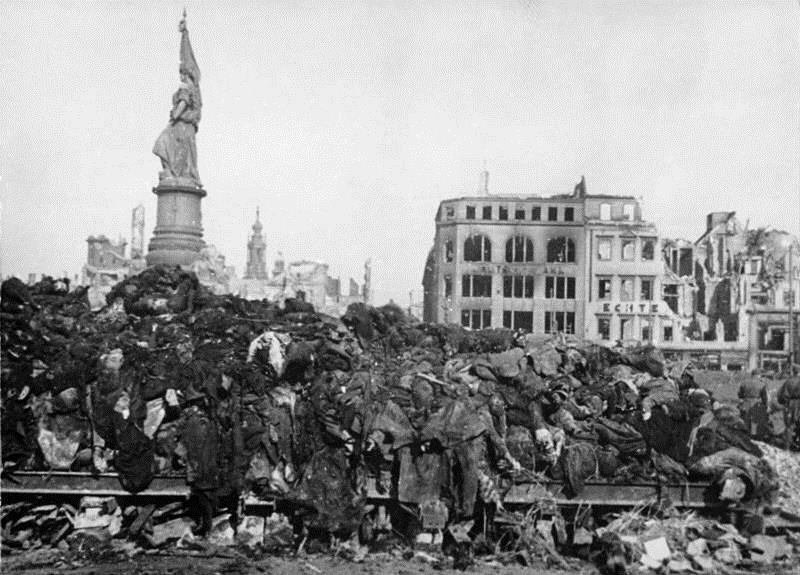 The discourse that filled Dresden after the initial bombings shaped the individual narratives Germans believed of the city for decades to come with the creation of a nuclear comparative postmemory of the events. In “Stumbling upon history: collective memory and the urban landscape,” authors Mary Rachel Gould and Rachel E. Silverman discuss the significance of state sanctioned memorials in shaping collective memory, countermemorials, and the difference in narratives and discourse created between the two. Gould and Silverman cite scholars Marianne Hirsch and Andrea Liss to showcase the active role memorials play in conceptualizing the “process whereby individuals come to understand historical places, particularly violent ones, through the circulation of other people’s memories in popular forms, such as ‘postmemory’” (Gould, p. 795). Further, they express how this can be an “instrument for the shaping of memory,” where a “double-consciousness of memory in the urban landscape can come ‘from above…and it can express the accumulation of memories from below’” (Gould, p. 795). While Gould and Silverman reference the work of these scholars to prove their own work with the importance of the Stumbling Stones countermemorial in Berlin, their point can also be applied to many other a like memorials. For instance, if one were to visit the city of Dresden and have no prior knowledge of the strong memory created by the state to relate Dresden to Japan the exhibit showcasing the horrors of nuclear bombs would not have the strike the same nerve as someone who knew this narrative (such as a Dresden local). 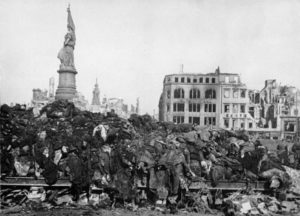 Here, the “double-consciousness of memory” becomes visible only when one is aware of the memory from below– the emotive memory of Dresden being bombarded. It is only visible with the creation of a countermemorial.